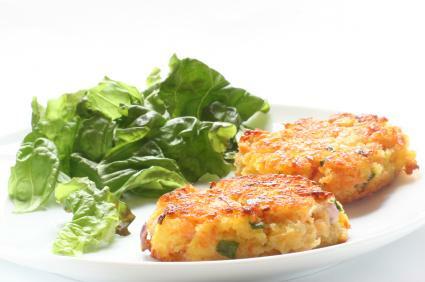 Crab cakes recipes are the best way to turn something as wonderful as crabmeat into something incredible. When preparing to make crab cakes, there are a few ways to get the actual crabmeat needed. Most supermarkets sell canned crabmeat and this is a pretty good option for several reasons. The most important, to me, is that I know how much meat I'm getting. If the recipe calls for one pound of crabmeat and the can says it has one pound of crabmeat, that part is taken care of...no muss, no fuss and I can get on with dinner. Choose the livelier looking and acting crabs. They are the healthiest. Look for crabs that are heavy for their size. They will have firmer flesh. To properly cook crabs, bring a large pot of heavily salted water to a boil. Drop the crabs into the water. Bring the water back to a boil. Reduce to a simmer and simmer the crabs for 15 minutes per pound. Two one-pound crabs should be thoroughly cooked in twenty minutes. The shell should be a vibrant orange color when the crab is done cooking. Shock the crabs by dropping them in some ice water briefly to stop the cooking. Since we are going to use these crabs in our crab cake recipes, you might want to leave the crabs in the water to cool them completely. This will make them easier to work with. Remove the legs and claws and crack the shell open using a nutcracker, a meat-tenderizing mallet, or just use your fingers to crack the shell. Remove as much of the meat as you can. To remove the back, hold the base of the crab and pull the upper shell away from the body. Turn the crab over and remove the triangle shaped section. Turn the crab back over and scrape away the gills, intestines, and anything else that does not look like crabmeat. Pile all the crabmeat into a bowl and weigh it. You will need one pound of crabmeat. Tear the crabmeat into small bits. Form into patties about three inches across and about ½ inch thick. Refrigerate the patties for at least an hour. Pour about a ¼ inch of oil into a frying pan and place it over a medium high flame. When the oil is good and hot, fry the crab cakes a few at a time for three minutes on the first side. Flip it over and fry them for two minutes on the other side. The internal temperature should be about 155 degrees. Serve with a salad and tarter sauce.